War, Memory, and the Politics of Humor features carnage and cannibalism, gender and cross-dressing, drunks and heroes, militarism and memory, all set against the background of World War I France. 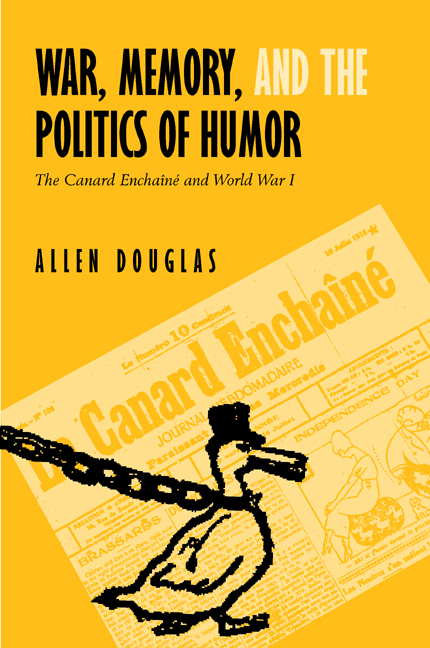 Allen Douglas shows how a new satiric weekly, the Canard Enchaîné, exploited these topics and others to become one of France's most influential voices of reaction to the Great War. The Canard, still published today, is France's leading satiric newspaper and the most successful periodical of the twentieth century, and Douglas colorfully illuminates the mechanisms of its unique style. Following the Canard from its birth in 1915 to the eve of the Great Depression, the narrative reveals a heady mix of word play, word games, and cartoons. Over the years the journal--generally leftist, specifically antimilitarist and anti-imperialist--aimed its shots in all directions, using some stereotypes the twenty-first century might find unacceptable. But Douglas calls its humor an affirmation of life, and as such the most effective antidote to war. Allen Douglas is Professor of West European Studies and History at Indiana University, Bloomington. His previous books include L'idéologie par la bande (with F. Malti-Douglas, 1987), From Fascism to Libertarian Communism (California, 1992), and Arab Comic Strips (with F. Malti-Douglas, 1994). 11. Politics as Usual: An Antiparliamentarism of the Left?